Nature’s Sunshine Trigger Immune TCM Concentrate is a blend of 18 herbs formulated to naturally aid healthy immune function. 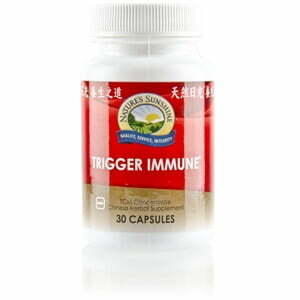 Trigger Immune TCM is considered to be an all-around well-being enhancement supplement. Instructions: Take two capsules with a meal daily. Each capsule is equivalent to 5 capsules of regular Chinese Trigger Immune combination. TCM denotes Traditional Chinese Medicine.